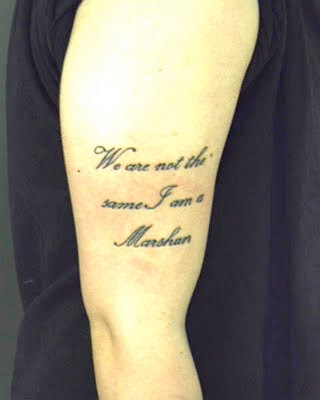 spends the last of his Lottery Funding on a new tattoo. "Me body is da canvas innit" he tells the Author. Is this based on the opening line of L Ron Hubbard's science fiction novel, Mission Earth: "We are not the same I am a martian."? It's possible. But we suspect it might be based on the popular title "Men are from Marsha - Women from Weiners"